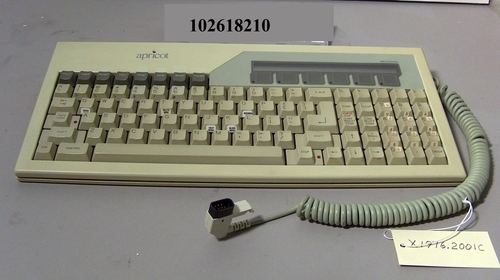 The consists of a keyboard with an attached coiled cable with a DB-9-P connector. The keyboard has a rectangular video screen, approximately 6 x 1/2 in., set near the upper right-hand corner of the key area. This object is stored in the original manufacturer's box for the related system unit (CPU box) listed above, as shipped by the manufacturer.. The key area is labeled "apricot" near the upper left-hand corner and labeled "MicroScreen" near the upper right-hand corner, just above the small video screen. There is an indicator lamp over the "apricot" label, and keys labeled "Stop" and "Caps Lock" have built-in indicator lamps. The area just under the video screen is marked off by six printed "tabs," each with a small indicator lamp. Several keys have small, glued-on paper labels, either on top of the key or on its front face. Some of these labels are printed; others are handwritten or typed. The label texts are program commands, and some are non-English alphabetic characters. Some of the labels are starting to peel off, and some are badly discolored. There is a recessed pin connector, with two rows of five pins each, in the back panel; it appears to match the connector on the associated mouse cable (X1976.2001D). There are a button labeled "Reset" and a thumbwheel labeled "Contrast" one the right side panel, near the upper-rear corner, where the cable is attached.